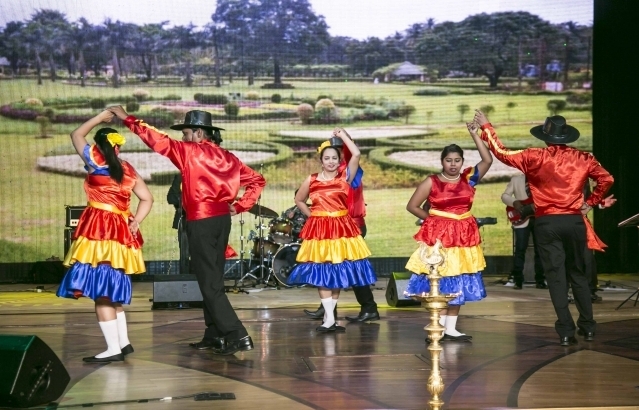 On the occasion of HOLI and NAURYZ Embassy of India and Swami Vivekananda Cultural Centre in Nur-Sultan organized a series of Music and Dance performances by“Pioneers of Quepem”- a Music and Dance Troupe from Goa, in three cities of Kazakhstan. The Troupe performed in Almaty, Nur-Sultan and Temirtau. After their first performance in Almaty on 12.03.2019, the Troupe performed at Nur-Sultan Music Hall in Nur-Sultan on 14th March 2019. An informative journal about Goa “Goa Beckons” was also released by the Ambassador on the occasion. The Spectators, which included local dignitaries, members of diplomatic corps and journalists, enjoyed the show. the troupe then performed in Temirtau at Temirtau Palace. The spectators were enthralled by their scintillating performance.